It all started with a £5 note! 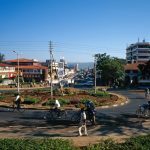 In November 1994 Peter Brierley received a letter from a pastor of whom he had never heard, with a family of three, living in a town called Kisumu in Kenya. He was unable to answer his request, but sent him £5 for his family. A note of thanks came quickly back saying that as well as his own 3 children he was also looking after 3 orphaned children of relatives. This time it was a £10 note that was sent. With increasing income from the UK following a visit in 2000 by a gap-year student called Ellie, from the same church as Cherry and Peter, a Trust was formed which in 2002 became a registered Charity. Stephen moved on from being the manager and Philemon replaced him. 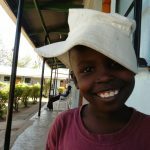 The Old Home was in a condemned building and long-term tenure was unwise, so in 2005 plans were drawn up for a fund-raising campaign in 2006 for £120,000 to build a new Kenyan- appropriate Home. In the providence and miraculous ways of God, that money was provided and in 2007 building work began and was 90% completed. The year 2008 was disastrous – for Kenya following disputed elections, as riots broke out torching many shops in Kisumu and killing dozens, and, in a totally separate incident at The Old Home, when it caught fire one night and was half destroyed, … tragically, one staff family except the father was lost in the fire. The Children’s Department in Kisumu allowed the children to move into the still-uncompleted new Home, which was then speedily finished and officially opened by the local Bishop on 28th August 2008. The new Home houses up to 48 orphans, half boys, half girls, all of whom are lovingly cared for, given clothes and regular meals, and attend Primary School. Depending on their ability they then go on either to Secondary School and/or Vocational Training, aiming to make each child as self-sufficient and employable as possible with a deep, firm Biblical faith of their own. The Home’s motto is “Help for today, Hope for tomorrow”, and nearly 200 have been helped in some way in the years since 1998 – and we want to help hundreds more in the years to come!